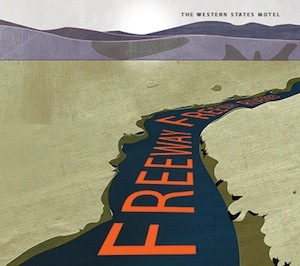 With both the artist’s and album’s names suggesting short stay locations punctuating a road trip, it’s no surprise that The Western States Motel’s Freeway Freeway Riverbed conjures up evocative images of landscapes somewhere along Route 66. The nine tracks of Freeway Freeway Riverbed are driven forward by the pleasant strum of solo-artist Carl Jordan’s acoustic guitar and his dry lead vocal. Deadpan song titles allude to the theme of visiting old things and viewing them with modern eyes. This is not so much nostalgia as informed reflection. In terms of arrangement, an organ and programmed drum beats mix up the acoustic formula on “Country and Western Song,” whilst “Mid-Century Modern Chair” uses jaunty piano and hand-claps to get you dancing. The glockenspiel in “I Drew Your Picture In The Sand” adds an unexpected, sprightly twist. Freeway Freeway Riverbed is a pleasant journey, steeped in the American acoustic tradition, but with a contemporary indie sensibility. A road worth traveling.